A Human Ecological Approach to Energy Literacy through Hands-On Projects: An Essential Component of Effectively Addressing Climate Change. Abstract: Mitigating climate change is among the most urgent challenges humans face. However debate regarding sustainable energy and options for reducing carbon dioxide emissions tend to be polarizing and frequently unproductive. Too often facts are lost in jargon and numbers that have little meaning for many, including policy makers. Further compounding the problem is the lack of a tangible connection for most citizens between fossil fuel use and environmental degradation. This lack of understanding limits our ability to have sensible discussions about our climate and energy future. A human ecological approach to teaching energy literacy is essential to ensure responsible environmental stewardship in the age of climate change. A powerful and effective way to address this is through project-based learning that helps prepare students, across disciplines, by providing them with the knowledge, skills, and habits of mind to be effective advocates for energy choices that reduce environmental harm. Having an informed and energy literate society is crucial to overcoming barriers and adopting policies that address climate change. There was a time in the not too distant past when only engineering students were computer literate upon graduating from college. As computers infiltrated every aspect of daily living, colleges understood the necessity that all graduates gain basic computer skills (Pearson 2002). That wave grew to present day when the vast majority of people have some knowledge of how to use a computer. The realities of global climate change and peak oil now force academia to embrace the same paradigm shift with regards to sustainable energy. Mitigating climate change and reducing fossil fuel use are among the most urgent challenges of the next decade (IPCC 2007). The challenge is multi-dimensional. Participation and innovation from people in all disciplines, not just science and engineering, is necessary. Addressing public conceptions of energy production as well as behaviors of consumption are paramount in the effort to reduce the burning of fossil fuels, which is by far the largest contributor to climate change (Smil 2006). It is widely recognized that public acceptance and understanding of energy and its link with climate is a critical factor constraining the development of renewable energy (Wustenhagen et al. 2007). Likewise, inaction and complacency, with regard to individual consumption habits, also stem from a lack of understanding of the complexities regarding sustainable energy (Dwyer 2011). This lack of understanding results from the absence of energy literacy on the practical side and an ideological separation of man and nature (Mulligan 2010) on the conceptual side. By making the human ecological connection between human behavior and the natural world, while educating students in the field of sustainable energy, we can broaden the reach of sustainability education such that all college graduates have both an appreciation of the interconnectivity of fossil fuel use and global climate change and are energy literate (UNESCO 2007). Human ecology is the science of interrelationships between people and the environment. (Marten 2001). A human ecological approach can generate ideas for dealing with environmental problems and increase awareness of how people and the environment function together. (Marten 2010). Energy literacy is the understanding of complexities related to energy use. An energy literate citizen can utilize vocabulary necessary to discuss matters of power, energy and climate change (Barrow 1987). A human ecological approach to energy literacy education presents both an opportunity and a challenge for higher education. The opportunity lies in the potential to engage students from a range of disciplines, as students tend to have strong interest and concern about the environment. In a 2008 survey of over two hundred forty thousand entering college students in the U.S., almost half said it was “very important” or “essential” to adopt green practices to protect the environment and almost three out of four responded, “addressing global warming should be a federal priority” (Pryor 2008). The challenge for educators is to go beyond traditional teaching that relies heavily on the one-way transmission of information by allowing students to participate in significant, real-world projects as a way to learn useful knowledge (UNESCO 2005). Fortunately the subject of sustainable energy lends itself to hands-on and team based teaching. Rather than focusing on the disastrous consequences of climate change, which has been shown to create anxiety (Dwyer 2011), students are empowered when they actively work to improve sustainability through real-world projects. Meaningful courses build on best practices in higher education such as project based learning and learning through direct experience (Vela 1994). A useful parallel exists between units of energy and power and units of distance and speed. Humans learn the relationship of distance and speed from a very young age. They learn by doing; by walking, jogging, biking and driving. People, in general, have a notion of how far a mile is and how long it will take to walk or drive a given distance because getting places is part of daily life. Teaching energy literacy through hands-on projects can instill that same familiarity with regards to units of energy. Hands-on, project-centered, sustainability education is transformative as it immerses students in solution-based learning (Moore 2005). However, providing meaningful projects given the time constraints of a college term and limited budgets, presents challenges. Wide-ranging math and science skills further compounds the challenge of designing meaningful projects that offer students some level of success. Ultimately the most successful projects compel students to engage in real-world efforts. The projects help students understand the scale and units involved in sustainable energy projects. Students’ ability to use and contextualize the numbers, which are frequently misrepresented, enables them to effectively advocate for themselves, their families, their communities and the planet. 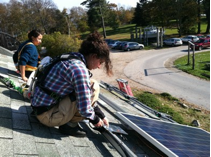 Enabling students to participate in positive, hands-on, math and science centered sustainable energy projects is the impetus behind four new classes at the College of the Atlantic (COA) in Bar Harbor, Maine. COA is a small progressive college on the coast of Maine that specializes in interdisciplinary education. COA’s educational model puts an emphasis on individual learning while awarding only one undergraduate degree, a Bachelor of Art in Human Ecology. Students have wide latitude to choose courses of interest that fit their career goals. In practice all students design their own individuals majors. 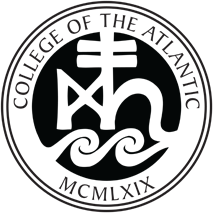 COA’s mission statement, reads in part, “A human ecological perspective integrates knowledge from all academic disciplines and from personal experience to investigate — and ultimately improve — the relationships between human beings and our social and natural communities” (COA 2012). This overarching theme of human ecology ensures that the importance of the connection between humans and the environment is not lost. And nowhere is the connection between human beings and the natural community more important than in the transition away from fossil fuels. The integrated educational approach at COA is also well suited to the complexities of sustainable energy. More often than not it is public resistance and economic tradeoffs, rather than technical barriers, that prevent the adoption of renewable energy and conservation measures (Walker 1995). The non-specialization of the student body makes COA an excellent institution to develop a range of hands-on classes that might otherwise be restricted to more technical majors at other schools. Absent of majors, most classes at COA are open to all students regardless of year or expertise. Each 10-week course is comprised of students from diverse backgrounds and countries with a range of skills, interests and experiences. It is not uncommon to have, for example, a first year science oriented student in class with a fourth year student who gravitates towards theater. This educational dynamic challenges the course developers to present material in a broad format that enables all students to become energy literate through hands-on engagement in sustainable energy projects. Over the last four years, we developed four project-based courses designed to teach energy literacy by furthering student understanding of technology, conservation and energy through hands-on projects. This unifying goal created the starting point for course development consistent with a ‘backward design’ strategy, originally articulated by Wiggins and McTighe (2005). Evaluation methods assessed essential learning outcomes and principles of excellence as defined by the American Association of Colleges and Universities (AACU) through its’ Liberal Education and America’s Promise (LEAP) initiative (LEAP 2010). This paper discusses the fundamental components of each of the four courses comprised of three practicum classes; wind power, electric vehicles and solar as well as ‘The Math and Physics of Sustainable Energy’. Additionally, this discussion includes the some of the challenges of project-based classes, assessment and outcomes of all four courses. Between 2009 and 2011, COA offered three energy-related practicum courses covering wind power, electric vehicles and solar power. Each of these courses ambitiously sought to complete a sizable project – install a wind turbine, build a vehicle and install a solar array – within the 10-week term. Practicum courses do not lend themselves to being offered each year due to the added funding requirements, logistics and spatial availability. However, having a group of practicum classes allows COA to offer a rotating mix of hands-on energy classes geared at project completion and energy literacy education. We have found that each practicum course has ignited interest and further demand for similar courses. 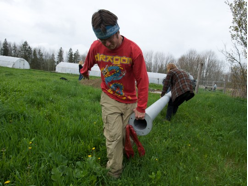 The course titled ‘A Practicum in Wind Power’, offered in the spring of 2009, focused on installing a 2.4kW wind turbine (Skystream 3.7, Southwest Windpower, Broomfield, CO) at one of the college’s organic farms. Students engaged in the many steps needed to complete the turbine installation including proper siting, sizing, foundation work, utility agreement and permitting. In addition to installing the wind turbine (Figure 1), the class worked together to prepare a comprehensive wind power presentation for the town planning board to assist them with their efforts to draft a wind power ordinance for the town. The student presentation was well received by the board and broadcast on the local television channel. Students in the wind power class were required to submit end of term reports on a particular aspect of wind power. 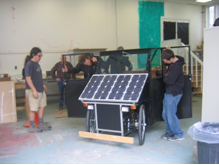 The course titled ‘Electric Vehicles Practicum’ class centered on building a neighborhood electric vehicle from a Sunn-EV kit (Haines 2011). This class was kept very small. Only one student in the group had knowledge of electric cars prior to the course. In addition, only two students came to the class with any technical expertise. The rest of the group was made up of a variety of backgrounds as is typical at COA. The students organized tasks and set up the schedule necessary to manage a project of this nature. Students often pushed themselves, and one another, out of their comfort zone in working on the project. For example, one person in the class whose comfort level lay in painting and upholstery for the vehicle ended up helping to install the batteries and related wiring. In addition to getting the vehicle built and working (Figures 2 and 3), the group developed both a maintenance manual and a users’ manual for the vehicle, as no such documentation existed from the manufacturer. Students in the EV class were required to give a final presentation and submit an in-depth final research paper on the physics and technology of one of the aspects of the electric vehicle. For example one student researched the various charging technologies for electric vehicles and did a comparative analysis of a few of the more promising options. The goal of the third practicum class, titled ‘A Practicum in Solar Power’, was to install a 12 panel solar array (TSM230, Trina Solar, China) on campus. Students in the class evaluated several potential sites on and off campus using solar measuring equipment. The site evaluations were the basis of presentations to the college administration. These presentations highlighted the benefits and drawbacks of the three potential solar sites. Consideration was based not just on technical merits, permitting and optimum solar performance, but took a wider view to included pubic perception and public education and awareness. Once a site was collectively chosen, students worked on dimension specifications, ordering, permitting and negotiating an interconnect agreement with the utility company. Upon arrival of the panels, the class worked to install the panels on the roof of a small building on campus (Figures 4 and 5). Installation was completed during the ten-week term. Although the students did not have sufficient time to evaluate the performance of the solar array, public online access to power production in real time has allowed all interested students to follow the performance of the panels. Interns working on additional solar efforts on campus are tracking the power production and using this information in the planning of other projects. The initial lectures for each of the practicum classes cover the basics of energy and power and the associated units. From this initial introduction to energy literacy, each course focused lectures on the specific technology at hand. Within that topic all of the courses covered history, physics, engineering, finance and social issues to varying degrees. Emphasizing the intrinsic link between human actions and initiatives with the environmental outcome is central to each to the practicum classes at COA. Of course there were stylistic differences between the courses as well. For example the wind power class lectures were by in large quite technical across the board where as in the electric vehicle class lecture time was divided between one lecture and one discussion time based on a reading of various related topics. The EV class welcomed two visiting lecturers early in the term; a local auto mechanic went through all of the systems of a conventional car and an auto historian from at the Seal Cove Auto museum in Trenton, Maine. These practicum classes are complemented by classes, which specifically focus on the math and science behind the technology. The math and physics of sustainable energy class is a more traditional lecture-based class. The class content is reinforced with a project, which allows students to demonstrate an understanding of the basic class content. The students specifically learn about sustainable energy by focusing their efforts on reducing the energy consumption of a building on campus. For example, the Arts and Sciences building on the College of the Atlantic campus served as the focal building for the spring 2012 course. This building houses the chemistry, biology and botany labs as well as some art studios, the IT department, several faculty offices, two computer labs and an attached greenhouse. Small student groups spent the duration of the term developing a plan, securing funding and implementing solutions. Through this effort they become more energy literate and learn about sustainable building practices and how to adapt that knowledge to other aspects of their lives and community. The class is structured on the major concepts in the book Sustainability without the Hot Air by Mackay (2009), which is used as the course text. In his book, McKay emphasizes making estimates or ‘rough calculations’ to figure out energy use and determine possible energy production from various renewable sources. McKay steps through the energy needs, conservation and efficiency opportunities and theoretically available sustainable resources for meeting energy demand in Great Britain. In the same way, course lectures cover several sustainable energy technologies such as wind, solar and geothermal as well as conservation and efficiency. Students learn to calculate space requirements, cost and physical limitations of each of these technologies. The math skills of the students in the class vary widely from students who have taken vector calculus to students who have not had a math class since high school algebra. Therefore, the emphasis is put on critical thinking skills and problem formation. The objective is for students to understand how to approach and evaluate sustainable energy questions to understand the limitations of a given technology. Take for example the statement ‘A one hundred thousand watt wind turbine can power one hundred homes’. Is this factual or is it the equivalent of ‘the store is two miles down the road, you can walk there in six minutes”? If successful in the course, a student can deduce the value of the former statement to be false almost as easily as one can discount the later statement. Students do this by combining energy facts, or benchmarks, with rough calculations regarding wind turbine energy production home energy consumption. Students are asked early in the term to develop a set of personal benchmarks to aid in the goal of contextualizing and evaluating energy related numbers. The initial lab activity for the class is to take power readings of a dozen or so appliances (fan, computer, toaster, radio, coffee pot, light, hairdryer, electric heater) using a commercial power consumption meter (P4400 Kill A Watt Electricity Usage Monitor, P3 International, New York, NY). Collected data is entered into a spreadsheet and is manipulated to calculate total consumption and cost over a week, month, and year. This exercise gives students their first awareness of the relative energy consumption of appliances and lights. Another lab in the class focuses on learning the financial aspects of sustainable energy projects using spreadsheets. Students are exposed to basic financial terminology such as ‘discount rate’ and Return on Investment (ROI) needed to evaluate the financial feasibility of renewable energy projects. Students experiment with numerous financial models using spreadsheets to vary inputs such as the cost of energy and rates. This exercise forces students to go beyond the science and social components of renewable energy and think about the financial viability of projects. Lectures and labs (Figure 6) encourage students to be critical thinkers regarding sustainable energy issues while giving them the tools and vocabulary to navigate within the discipline. This lays a strong foundation that supports students as they work to complete the hands-on conservation, efficiency and renewable energy projects that are at the center of the course. The term-long student projects not only serve as an effective learning strategy (Alevarza 2006) but also foster a human ecological approach to problem solving. Students are encouraged to take a wide view of their projects and consider the human, social and economic impacts as well as technical merits. In keeping with the mission of COA, the projects “ prepare, and expect students to gain expertise, breadth, values, and practical experience necessary to solve problems that challenge communities everywhere” (COA 2012). At the start of term the class gains general knowledge about the building systems, energy consumption, history, and current and projected use through tours and discussions with building users, the architect, the buildings and grounds director and by looking at utility bills for fuel and electricity. Armed with this information, the class of twelve students was divided into four self-forming groups. These groups each were assigned a project. The projects included an evaluation of plug loads, lighting, air conditioning, hot water and the energy use of the attached greenhouse. Students performed research on their chosen topics in the first part of the term and developed proposals for improvement. After five weeks each group presented their findings to the administration in a formal presentation that detailed the existing situation, solutions for improvement, the associated cost and the payback. Each group received some portion of their funding request. In the second five weeks, groups worked to implement their proposals and begin to collect data. Two examples, reducing air conditioning in a server room and improving climate control in an attached greenhouse are representative of the projects’ efforts. The server room group concentrated on reducing the use of air conditioning. Many of the servers for the building are housed in a small, windowless room in the center of the building that is bordered by hallways on two sides. Both the incoming and outgoing ventilation ducts, near the room’s ceiling, were sealed shut. To keep the servers from over heating an air conditioning unit is set to come on when the temperature reaches 75 degrees. Using an energy monitoring system (Savant, 2012) the group collected minute-to-minute data on the air conditioner energy use. Temperature sensors provided air temperature measurements inside and outside of the room (Figure 7). Using this information, students calculated the potential cooling effect of increased airflow in the room by cutting a vent into the bottom of the server room door leading to the hallway while unsealing the outgoing ventilation duct attached to the heat recovery system. The group met numerous times with the IT department to determine the operational specifications and understand the subtleties of the system. At the mid-term presentation the group articulated a detailed plan including the effects of the added heat to the buildings heating system throughout the year. Funding for this project was about $100. Once approved, the group researched and purchased the proper door vent, then assisted with the installation. Temperature and airflow monitors, also purchased with their funding, aided the group in collecting more data and calculating the effectiveness of their work. The green house project involved more complex tradeoffs. The attached greenhouse consumes a large portion of the building energy. The group started by investigating greenhouse performance as well as current and proposed uses for the space by interviewing numerous users of the space. Ultimately the greenhouse group approached the project from an optimum use standpoint. Their extensive research proved valuable as they concluded that in addition to the greenhouse performing poorly as a teaching environment, there are plans to build a new greenhouse on campus in the relatively near future. Given these inputs, the group chose to focus on low-cost improvements to increase performance while reducing energy consumption. To collect ideas the group toured several greenhouses in the area and interviewed numerous experts on the topic. For their mid term presentation, they provided numerous, low-cost ($50-$150) improvements including weather stripping, insulation and temperature and humidity data loggers as well as two more costly projects: adding thermal mass and installing a thermal blanket. These options were in the couple of thousand dollar range each. The projects for the class served two primary purposes. First, they reinforced the premise that conservation and efficiency are key components to addressing issues of energy and climate change. Although arguably not as glamorous as solar and wind power, they are a critical first step. Second, students learn first hand the effort and organization required to manage a project from beginning to end. Beyond being a valuable skill, this exercise raises awareness of the size of the effort needed to carry out state or country scale energy projects like those discussed during lecture. Project-centered courses can pose several challenges for educators including the need to address diverse student skill sets, logistical and funding challenges. COA has ten-week terms. This is a tight timeline to complete a sustainable energy project. Add to the challenge, finite funding and the steep learning curve for many of the students and successfully completed projects are not assured. The first step of any such class is to convey this uncertainty to the students. Often students find excitement and challenge in the uncertainty and embrace the chance to work on a real project that does not have predetermined results. During round table course assessment discussions, students overwhelmingly expressed appreciation for being thrown into a project from day one as it forced them to learn ‘on the job’. One of the central challenges that arise in teaching these sorts of classes is the diversity of skill sets within the class. All of the courses discussed here fulfill a quantitative reasoning graduation requirement for students. However, in an effort to educate all students in energy literacy, the only prerequisite for the classes is high school algebra. The result is that a portion of each class are students with very little math knowledge who take the class due to interest in the subject and or to fulfill a graduation requirement. With class sizes ranging from six to twenty six, the contrast of math savvy students with those less comfortable with math is significant. The challenge is to design material so that there is interest across a range of backgrounds. Hands-on projects are excellent for dealing with such a spectrum, as they require a wide spectrum of skills and strengths from all participants (Alvarez 2006). The result is that all students are challenged in some aspect of the project. Funding raised for a project-based class is expected to produce an educational outcome as well as an installed final product such as a wind turbine or solar array. This poses a challenge for instructors, as they need to balance student ownership of the project with a level of certainty regarding completion of the project by the end of the term. With the wind turbine course, for example, the lengthy permitting process required that the type of turbine and the site be determined prior to the start of term. As a result, the students were not able to have direct input in this process. Instead students were tasked with evaluating several sites for the turbine and investigating other turbine models, then comparing their finding with the actual permitted site and turbine. Although this offered some perspective, many students expressed a feeling of detachment to the project during the first part of the term. Time constraints and permitting had less of an impact on the solar class. The students evaluated and presented three potential sites for a twelve-panel array to the college administration. Variations in permitting time for the three sites due to location and supporting structure played a significant role in the final siting decision. However, this effect was minor and the students completed the project including choosing and ordering panels as well as the final installation. The courses each had a unique funding structure. Funding project-centered courses is a continuous challenge. Capital expenses for equipment and services such as electricians require a significantly larger budget than a non-project based course. The extra funding required for these courses is problematic in the current economic environment. A number of approaches were employed to fund the sustainable energy project-based classes at COA. For the Wind Turbine Practicum class a five thousand dollar grant from the Maine Space Grant Consortium (MSGC) and fifteen thousand dollars in funding from individual donors provided the necessary capital for the wind turbine course. In calculating the return on investment (ROI) for the project, students discovered that the payback was over one hundred years. This proved very educational as it lead to further investigation of the two primary reasons for the long payback, tax incentives and local ordinances. As a tax-exempt institution the college cannot benefit from federal and state tax incentives and rebates. Students learned that these rebates could make a significant difference in the feasibility of wind projects. Secondly, the local town ordinance treats wind turbines as ordinary structures and caps their height at forty feet. One of the central physics principles taught in the class is that the energy produced by a wind turbine is directly proportional to the cube of the wind speed and that wind speed increases with altitude. Armed with this information, students begin to appreciate the impact that local ordinances can have on wind power projects. Their presentation to the planning board emphasized the need for allowing higher turbines due to increased wind speeds. The following year the town adopted a new wind ordinance with a higher tower allowance. Therefore, future wind turbine classes will have the advantage of taller installations. The solar class solar array funding, fifteen thousand dollars came from a local investment group that is a low profit, limited liability corporation (L3C). This is a recently developed legal structure that allows a corporation to have a mission other than strictly profit (Strom 2011). In this case, MDI Clean Energy Partners is an L3C with an education mission. In this scenario, the L3C buys and owns the solar panels then sells power back to the college. Then, after a specified number of years, the college can buy the panels from the L3C. This standard practice allows the project to benefit from tax incentives and rebates from the state and federal government, giving the project a better return on investment. Students in the class learned first hand about this financing structure from members of the L3C, then negotiated with them to secure utility rates for the college. Ultimately students calculated the payback for the project. Analyzing this result spurred a broader conversation within the class regarding the more subjective measure of the Value of Investment (VOI), which takes into account the value of student learning, public awareness and wider benefits for the college. The electric vehicle class was a joint effort of the Seal Cove Auto Museum and the college. The EV provides PR for both institutions as the logo of each is on the vehicle. A memorandum of understanding between the museum and the college allows the college to utilize the vehicle during the year and the museum to use it for shows and events. The project cost a total of eight thousand dollars, including materials and the initial kit cost, shared between the two institutions. Since the car is not licensed for driving on public roads, it is utilized on campus by the buildings and grounds department as well as food services. Seal Cove Auto Museum uses the vehicle as an educational display for various events. Overall, the cost to COA was four thousand dollars. In the ‘Math and Physics of Sustainable Energy’ course, groups presented proposals to the administration requested anywhere from one hundred to five thousand dollars for their project proposals. As many of the projects involved conservation and efficiency measures such as weather stripping and ‘on-demand’ hot water, the college was able to use existing maintenance budgets to supply at least some of the funds. The chief financial officer for the college reviewed the proposals and allocated funds for projects that had payback periods of less then ten years. This assessment was followed by a financial explanation of the significance of a ten-year payback. Some funds were also allocated out of an existing education budget for monitoring devices. Each group received at least a portion of their funding request. Evaluation methods assessed essential learning outcomes and principles of excellence as defined by the American Association of Colleges and Universities (AACU) through its Liberal Education and America’s Promise (LEAP) initiative (LEAP, 2010). Courses contained both summative and formative assessment measures. Summative assessment, known as assessment of learning (Earl, 2003), is used primarily for student performance. For most of the courses summative assessment methods included presentations, final reports and successful project implementation. Hands-on courses that have ambitious goals for project completion, as is the case with all of these courses, simplify summative assessment to a certain degree. Successful completions of the project, such as an installed wind turbine or working electric vehicle, are good measures of evaluation. Individual presentations and reports demonstrated individual mastery of course concepts and overall energy literacy as well as serving to highlight students who might have participated to a greater or lesser degree in the success of the project. Formative assessment is described as assessment for learning (Earl 2003) and used to assist in course diagnostics (Keshavarz 2011). This assessment provides insight needed to improve courses over time (Sperandio 2010). Formative assessment tools used included group critiqued student presentations, mid-term round table discussion about the course and end of term student surveys. The formal surveys are standard across all courses, which allows for close comparison. Surveys include a number of questions regarding what a student learned, teaching methods and student interest in the topic. The combination of formal [surveys] and informal [group discussions] provided opportunities to evaluate the varied components of the courses including group work, project management, course structure and overall effectiveness. The mid-term round table discussion was helpful in gauging students concerns and enthusiasm. Often feedback included suggestions for modifying the rest of the class to maximize student learning and/or project completion. For example, in the electric vehicle course, the time required for the construction of the vehicle was unknown. At the time of the course only a small number of kits had been built and with varying degrees of success. Therefore a majority of scheduled class time was dedicated to working on the vehicle and developing associated manuals. By the midterm round-table discussion, students expressed confidence that the vehicle would be completed within the term and proposed that more time is spent learning the physics, engineering, history and politics of electric cars through lectures and class discussion of pertinent readings. Student feedback for all four classes was overwhelmingly positive. Students commented, both on written surveys and in-group discussions, on the value they found in learning through working on a project. Many students expressed pride in acquiring new hands-on skills using tools and equipment, while others noted appreciation for their exposure to project management. Another common theme was student satisfaction with impacting the wider community, as it aligns with their broader education goals of human ecology. Each course had a venue for students to share their knowledge with a wider audience. Additionally, the wind turbine, EV and solar courses all had an unveiling event in which students could show off their hard work and further explain the experience. In addition to presenting their projects to the community, students in the ‘Math and Physics of Sustainable Energy’ course submitted a final report detailing their research, proposals and results of implementation. Included in these reports were details of efforts that either proved unsuccessful or just not feasible within the time constraints of the term. The impact of this work is cumulative, as it will serve as material for future courses at COA as well as other institutions. There is real and perceptible value in project based courses. Students gain project management skills through completing tangible projects that have actual value for them and their community. There are several challenges for educators offering these types of courses, not least of which are time and financial constraints. Ensuring that projects are completed within the term must be carefully balanced with student involvement and ownership of as many of the project tasks as possible. 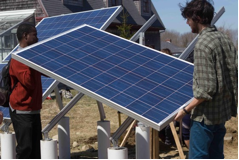 Enabling students in higher education to be active participants in hands-on renewable energy projects is an effective means to teaching both specifics of energy literacy and the broader issues of human behavior and ecological impact. The challenges posed by climate change and peak oil are inextricably linked to human behavior and understanding about energy consumption and production. While a broad range of skills in the citizenry are needed to address hurdles in technology and policy, everyone must be energy literate to facilitate real change. The Maine Space Grant Consortium provided funding for the Wind power course and the Physics and Mathematics of Sustainable Energy course via their Education Program and their Two-Year Research and Higher Education Program, respectively. The wind turbine itself was funded by donations from Sam Hammil Jr., Willy Osborne, and the Hildreth Family Fund of the Maine Community Foundation. Partial funding for the Sunn EV electric car kit was provided by the Seal Cove Auto Museum. Engineering expertise for the solar installations at the farms was provided by Robert Parker, who also taught the solar class. Over the course of these projects we have benefited from discussion, advice, and support from: Bonnie Burns, Siegmar Eschholz, Jay Friedlander, David Hales, Bob Harris, Andy Griffiths, Steven Katona, Willy Osborne, and Robert Parker. Place. International Journal of Sustainability in Higher Education, v7 n2 (2006) 176-188. Barrow, L. H., Morrisey, J. T. Ninth-Grade Students’ Attitudes Toward Energy: A Comparison Between Maine and New Brunswick. Journal of Environmental Education, v18 n3 (1987) 15-21. College of the Atlantic (COA). COA Mission Statement, http://www.coa.edu/mission.htm (2012). Environmental Sustainability. Low Carbon Economy, (2011) 123-137. Learning. Thousand Oaks, CA: Corwin Press (2003). Haines, A. Sunn EV Assembly Manual, Retrieved August, 2012 from http://www.sunnev.com/ (2011). IPCC, Summary for Policymakers. In: Climate Change 2007: The Physical Science Basis. Contribution of Working Group I to the Fourth Assessment Report of the Intergovernmental Panel on Climate Change [Solomon, S., D. Qin, M. Manning, Z. Chen, M. Marquis, K.B. Averyt, M. Tignor and H.L. Miller (eds.)]. Cambridge University Press, Cambridge, United Kingdom and New York, NY, USA. (2011). D.C.: American Association of Colleges and Universities (AAC&U), http://www.aacu.org/leap/vision.cfm (2010). MacKay, D. Sustainability Without the Hot Air, Cambridge, UIT. (2009). University Level. International Journal of Sustainability in Higher Education, v6 n4 (2005) 326-339. Mulligan, S. Energy, Environment, and Security: Critical Links in a Post-Peak World. Global Environmental Politics v10 n4 (2010). Pearson, G., & Young, A.T. Technically speaking: Why All Americans Need to Know More About Technology. Washington, DC: National Academies Press (2002). Pryor, J.H., Hurtado, S., DeAngelo, L., Sharkness, J., Romero, L.C., Korn, W.S. and Tran, S. The American freshman: National Norms for Fall 2008. http://www.gseis.ucla.edu/heri/pr-display.php?prQry=28. (2008). Savant Systems LLC Smart Energy Monitor. Retrieved August 2012 from http://www.savantsystems.com/product-details/smartenergy_monitor_.aspx (2012). Science Forum Conference, Paris, (2006) 17-18. Sperandio, J., Grudzinski-Hall, M. and Stewart-Gambino, H., Developing an Undergraduate Global Citizenship Program: Challenges of Definition and Assessment. International Journal of Teaching and Learning in Higher Education, v22 n1 (2010) 12-22. Address Sustainability. Education for Sustainable Development in Action. Technical Paper No. 2. Retrieved August, 2012 from http://unesdoc.unesco.org/images/0014/001433/143370E.pdf. (2005). Educating Adults. San Francisco: Jossey-Bass (1994). Walker, G. Renewable Energy and the Public. Land Use Policy v12 n1 (1995) 49-59. Wiggins, G. & McTighe, J. Understanding by Design, Expanded 2nd Edition, Prentice Hall (2005). Wüstenhagen, R., Wolsink, M and Bürer, M. Social Acceptance of Renewable Energy Innovation: An Introduction To the Concept. Elsevier Ltd. (2007). Figure 7: Math and Physics of Sustainable Energy: Group member for server room AC project taking measurements.